​This is a past event. View and download the presentations given at the 2019 Winter AAS SOFIA Workshop by selecting the links below. The Cookbook Recipes used in the workshop may be found here. Important Update: The SOFIA Science Center has waived the registration fee for the workshop to ensure that all interested students and scientists attending the 2019 Winter AAS have access to this opportunity to get assistance with learning to use SOFIA data. Astronomers interested in learning how to analyze SOFIA data are invited to enroll in the upcoming SOFIA workshop at the AAS. Participants will have the chance to work directly with SOFIA scientists on recently obtained, publicly available data sets from polarimetry observations using the High-resolution Airborne Wideband Camera-plus (HAWC+) and imaging and spectroscopic observations from the Faint Object infraRed CAmera for the SOFIA Telescope (FORCAST). The workshop will begin with guided tutorials on working with and analyzing public data using SOFIA data analysis recipes. The tutorial will be followed by an interactive session where participants can analyze SOFIA data independently, with assistance readily available from SOFIA scientists. Public datasets like the polarimetry maps of 30 Doradus, recently obtained by HAWC+ will be made available to follow along with the tutorial and for the interactive session. Register for the workshop​ on the AAS registration page. If you are already registered for the meeting, you may revisit the registration page to add the workshop. 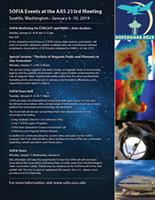 SOFIA is organizing this special session to highlight recent advances in observing and understanding magnetic fields and filaments in star formation. It is intended to bring together the latest studies of magnetic fields in star forming regions and the galactic environment. The goal is to better understand the role of magnetic fields shaping interstellar matter into the observed filaments, funneling atoms and molecules to enhance star formation efficiencies, and supporting clouds against collapse. Awards for the 2018 Best SOFIA Paper and Best SOFIA PhD Thesis will also be announced at the event. Due to impacts to the aircraft’s schedule, all tours scheduled for Monday, January 7-Wednesday, January 9, are cancelled. SOFIA is excited to offer tours of the observatory! SOFIA will be on hand for the AAS meeting and will be based at nearby Boeing Field. Buses will depart the Seattle Convention Center at regular intervals on Monday morning, January 7, and throughout the day on Tuesday, January 8 and Wednesday, January 9. Guests will tour the interior of the observatory while learning more about SOFIA’s recent science observations. There is no cost for the tours, however, space is limited. SOFIA tours are extremely popular, if you want to receive the announcement of the opening day of tour registration please subscribe to our newsletter, and keep an eye on your inbox! View the official tour page here.